eCite - The Gold Coast Marine Precinct: Pre-Packaging Entrepreneurship? The Gold Coast Marine Precinct: Pre-Packaging Entrepreneurship? 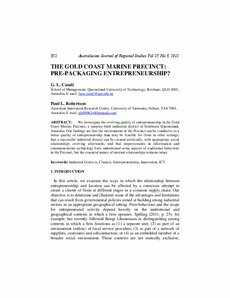 We investigate the evolving quality of entrepreneurship in the Gold Coast Marine Precinct, a purpose-built industrial district in Southeast Queensland, Australia. Our findings are that the environment in the Precinct can be conducive to a better quality of entrepreneurship than may be feasible for firms in other settings; that a successful industrial district can be created artificially, with appropriate social relationships evolving afterwards; and that improvements in information and communications technology have undermined some aspects of traditional behaviour in the Precinct, but the essential nature of internal relationships remains intact.